Thai Dive Expo 2016 marks its 11th anniversary this year. Also PADI (Professional Association of Dive Instructors) marks its 50th anniversary. Miguel’s Diving will be in Bangkok to help celebrate! We have been operating for over 13 years now. Indonesia’s Ministry of Tourism has an entire pavilion. It is located next to the Speakers’ Stage. The Ministry of Tourism has invited Miguel’s Diving to represent Gorontalo. Other dive operators and resorts come from across Indonesia. 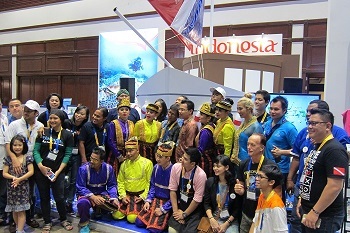 This year’s theme is “Wonderful Indonesia.” For Thai Dive Expo 2016 a troupe of dancers will attend. They will perform various traditional dances from across Indonesia. The schedule is available at the pavilion. Performances are four times daily. As in many previous years, Thai Dive Expo 2016 will be held at Queen Sirikit National Convention Center. It is located in Bangkok, Thailand. The dates are 12 to 15 May. This dive expo coincides with Thai Golf Exhibition, as well as Wonderful Thailand Travel Fair. At Thai Dive Expo 2016, we are offering discount dive packages. Drop by to see us! The theme for Thai Dive Expo 2016 is “Love of the Sea.” An underwater photo competition seeks to illustrate this theme. An underwater photo from Gorontalo won First Runner Up prize in the compact plus category. The many photo entries are available for viewing. They are displayed outside the exhibition hall. Thai Dive Expo 2016 also has a series of speakers. They include Imran Ahmad. He is a well-known underwater photographer from Singapore. He will speak twice. Recently, he spent a week in Gorontalo for a magazine photo shoot. His photo of twin Salvador Dali sponges will be on display. Miguel’s Diving wishes to express its thanks to the team of Indonesian’s Ministry of Tourism for this opportunity to participate at Thai Dive Expo 2016. If you are unable to attend this expo, please book your dive trip on-line.